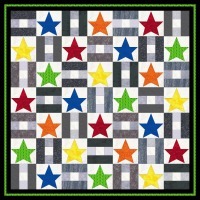 Star Bright Quilt 47" x 47"
Joannes Designs Week22 'Star Bright Quilt' a design I created using two different blocks. 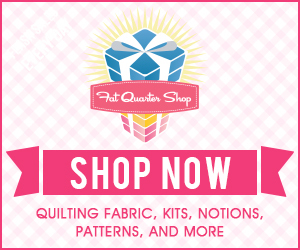 I am having fun designing quilts made from several different blocks. I'm hoping to extend this block combination later in the year. 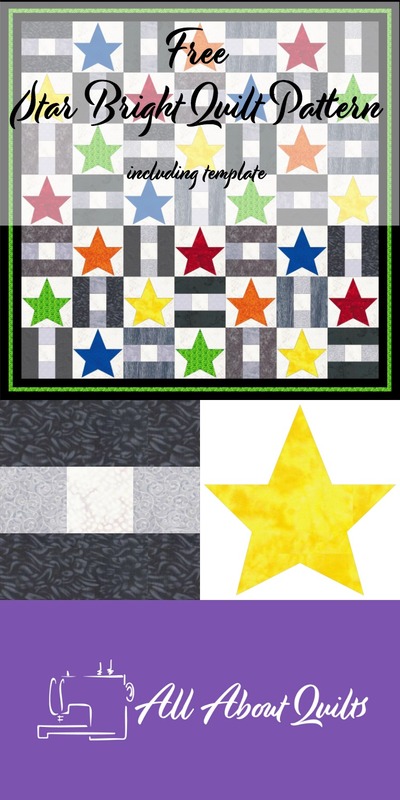 The first is a simple 9 patch block variation and the other block is a simple star applique block. I have kept the background fabric of this block very light and the applique stars lovely and bright. The finished size of this quilt makes it an ideal throw quilt. To make it suitable as a generous baby's quilt you would need to add 2 extra rows and columns bringing the finished size to 59" x 59". 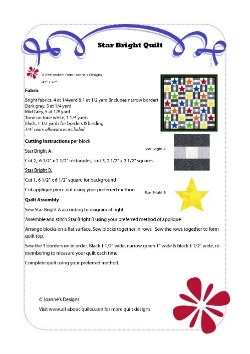 To make this quilt you will need to make 49 blocks, 25 in Block A and 24 Star Block B. Each block is finished at 6" x 6" and are easily cut using the rotary cutting guide and the applique template below. 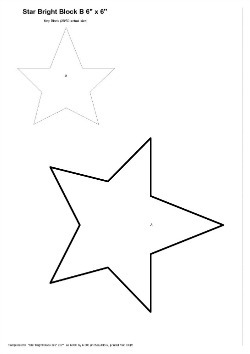 When making the 24 appliqué star blocks it is best to read the manufacturers instructions for the bonding web you use. My personal preference is Steam a Seam. I also like to use an Appliqué Pressing Sheet. These are fantastic as they keep your ironing board clean as well as allowing you to place the appliquéd flowers centrally on the block as they are see through. 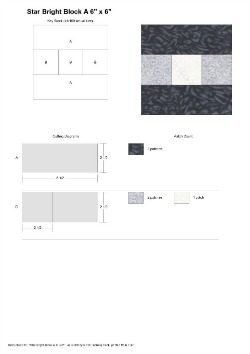 To download the pattern, rotary cutting block guide or applique template click on the relevant image below. 1. Cover ironing board with an old towel or similar. 2. Spray a light coating of starch on background 5" square then iron with a dry iron. 3. 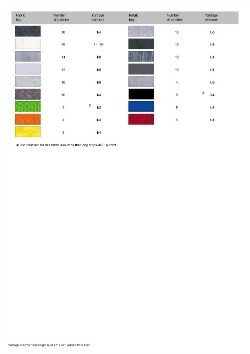 Repeat till fabric resembles very fine card. Usually 2 or 3 applications. You can do this to all the backings at the same time. Once your quilt top is finished most of the spray starch will have gone. 1. Trace around the appliqué template onto steam-a-seam. Rough cut out - not on the lines but about a 1/4" or so away. 4. Peel off the second paper and discard. Position star right side facing centrally onto the right side of the 6 1/2" background fabric. Press. I hope you enjoyed Joannes Designs Week22. 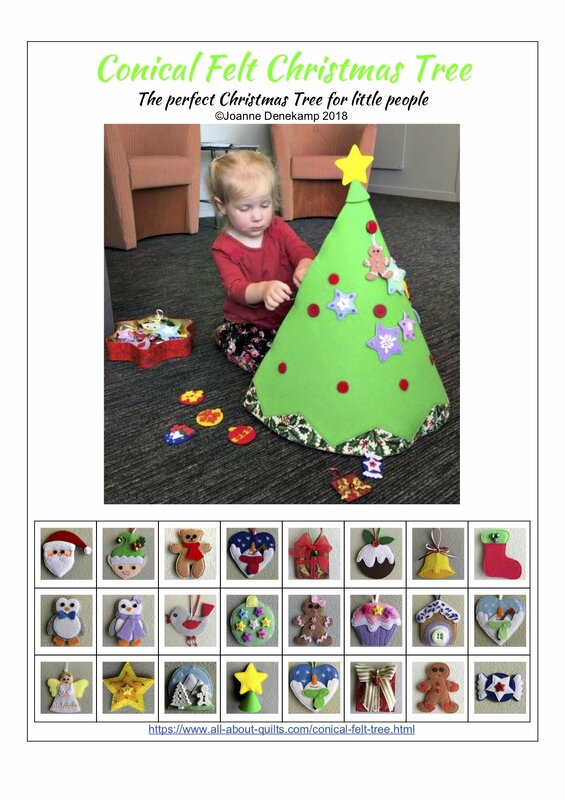 Just 30 patterns to go!